Pamphlet for participants in the "Occupy" aka "99%" movement, explaining why the problem is not "corporate greed," but capitalism, and what is meant by capitalism, crisis, anti-capitalist struggle, and "occupation" in a (libertarian) Marxist sense. Pdf of illustrated pamphlet for printing here. The “99% Movement” has adopted the term “occupy” from the anti-capitalist tradition, in which people have occupied workplaces, neighborhoods, school buildings, etc., as moves toward taking control over the "means of production" in order to make things and share them, “from each according to ability, to each according to need,” without the mediation of money. 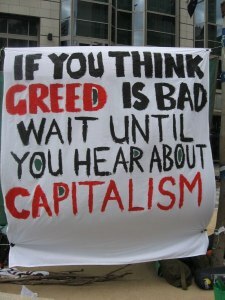 However, starting with the original Adbusters call, an influential current within the movement has suppressed this history, treating “occupation” as a temporary and symbolic means of petitioning the government to crack down on “corporate greed” and “corruption.” As anti-capitalists, we oppose such reformism not because we're attached to some “radical” identity, and certainly not out of nostalgia for the old “socialist” movements (whether of Stalinist or social democratic varieties – both ended up producing only different forms of capitalism). It is simply that the reformist agenda has failed repeatedly. (Anti-capitalist movements, on the other hand, from the Paris Commune of 1871 to the present, have only been defeated, or undermined by confusion; prior to defeat, they have shown some promising beginnings.) Reformism has failed because any meaningful pro-worker regulations eventually become fetters to capital’s health, so it becomes necessary to dismantle them - to “save the economy” (i.e. capitalism). That’s what we’re experiencing now, and a return to more regulation, more taxing of the rich to fund social services, etc., is something capital cannot afford without first restoring the rate of profit, which (if possible) would require more of the same: rising unemployment, falling wages, cuts to public goods and services, and the acceleration of energy wars and environmental devastation, bringing us ever closer to catastrophe. So reformism is “utopian”; the only “realistic” way out of this mess is the path we have yet to forge. a. Industrial capitalists (from the bourgeoisie) invest money (known as capital*) to rent land and buildings, buy machinery and raw materials, and hire proles to produce Commodities for sale – not because capitalists want Money to buy other Commodities (the traditional logic of commodity exchange, C-M-C), but in order to make a profit, that is, more money than was originally invested (M-C-M’). b. This trick is possible because the capitalist pays us for only part of the value we produce. For example, a prole named Lori works 8 hours for $10/hour, assembling hamburgers at McDonald's. The 400 hamburgers she makes during those 8 hours sell for $2000. The beef, buns and other materials cost $1000, and the utilities, wear and tear on equipment, and other expenses cost another $900, totaling $1900. So Lori’s labor added $100 worth of value to those materials, but she was paid only $80, so Mr. McDonald made $20 net profit from the unpaid portion of Lori's labor that day. If there are 10 employees per shift working at the same average rate of exploitation, and two shifts per day, then Mr. McDonald nets $400 each day from that store, $12,000 per month. c. So right at the point of production, there is an irreconcilable contradiction between capital and the labor necessary for capital’s growth. Our interests are fundamentally opposed: the longer and harder we work, the more profit the boss makes, and vice versa: if we try to lighten our work load, whether in time or intensity, or if we demand higher wages or safer conditions, we cut into the boss's profit. This contradiction cannot be resolved through compromise, since capital will die if it doesn't grow, and capital can grow only by “sucking” more “living labor” from workers. This is the basic logic of capitalist investment, M-C-M': capitalists don't invest in order to exchange their assets for something they want to use, but in order for their money to give birth to more money, and if it doesn't do that, they may as well sell their assets and buy a tropical island. At the same time, competition with other companies forces them to constantly increase the rate of exploitation – either by making us work harder or longer, or by switching to new equipment that can produce more products per labor-hour, or that can be operated by cheaper workers. Every now and then the workers manage to push down the rate of exploitation, but when that is limited to one firm, it threatens the firm with bankruptcy (since other firms in the same industry are continuing to operate at a higher rate); when workers push down the rate of exploitation for a whole industry, capital floods out of that industry in search of more profitable opportunities, leading to mass layoffs (as we've seen with the auto industry); when it affects the system as a whole, we have a crisis, which is capital's way of trying to restore the rate of profit. (4) Dog-eat-dog competition among capitalists on a (free or regulated) market. This is why subjective attitudes like greed are irrelevant: even if an entrepreneur happens to be Mother Teresa, and her whole reason for going into business is to create humane jobs, do “green” production, and give to charity, either her products are limited to a tiny niche market for rich people trying to assuage their guilty consciences (like the “fair trade” market), or more likely, her products are undersold by other companies that pay their workers slightly less, or pollute a little more. She is forced to follow their example or go bankrupt. No amount of government regulation can fundamentally change this: such regulation cuts directly into profit, so there is always a tug of war between capitalists and anyone who tries to regulate the market by raising the minimum wage, improving environmental protection standards, etc. This tug of war is really a displacement of the class war between capital and labor: the state and most official “labor” organizations are just responding to, or trying to preempt, widespread proletarian resistance, and as mentioned above, this war cannot end in a truce: capital must keep pushing back to restore the rate of profit, which means undoing previously made regulations. (4) the opening of new markets (on Mars? ), and the continued creation of new lines of products (for those who can afford them), commoditizing any spheres of life yet to be commoditized (our dreams perhaps?). That is, if capital doesn’t destroy us first through military or ecological apocalypse... Or if we don't end the reign of capital by turning this movement of "'Occupy' protests" into a movement to occupy the means of production . Throughout the 19th century, capital restored its rate of profit about every decade through a crisis of two or three years. In the early 20th century, imperialist expansion postponed crisis until the great crash of 1929. It then took a decade of depression and the most devastating war in human history to liquidate enough old capital, plunder enough "resources," and open up enough new markets to restore the rate of profit, creating the conditions for the Golden Age of both capitalist growth and pro-working-class regulation, from 1945 to about 1970. Don’t forget it was at the end of this boom, in 1968, that relatively “privileged” workers and students throughout the First World erupted in revolt against the spiritual poverty of capitalist prosperity, and against “work” itself. That was the best life has been under capitalism for many of those who brought France close to revolution; that is about the best reformism can hope for, and we probably wouldn’t survive to see even a return to that. If the 99% Movement fails to produce the revolution we need, don't lose hope! At least we're finally coming together, building networks for future struggles, figuring out what doesn't work, and learning to cooperate, inclusively and democratically, to take things, make things and share them without the mediation of money, political parties or the state - building foundations for a new, truly free society "within the shell of the old.” Now let's move on to a permanent global strike and the occupation of everything for everyone! $400 each day from that store, $1200 per month. "by mining the bodies of humans and other animals for “resources” such as organs, plasma, DNA…; [...](4) the opening of new markets (on Mars? ), [...]commoditizing any spheres of life yet to be commoditized (our dreams perhaps?)." Anyone I give this to is going to glaze over by the time they get to this part, it sounds like some nutjob conspiracy theory. Speculation on how capital can extricate itself from the crisis by harvesting our organs or opening markets on Mars is not going to win any hearts and minds and will only leave readers thinking the writer is mentally unstable. Thanks for pointing out the typo - I corrected it. As for the beginning being jargony, I know what you mean. Maybe it would be better to change the order - start with "the original Adbusters call..." then go on to say "but the term 'occupation' has this other radical history..." Or do you have another idea? I don't want to make it much longer than it is, and worry people's eyes will glaze over (mine would) if it starts with a long soft intro about "this movement's great, guys, good job!" (the way a lot of pamphlets to). Regarding the "wingnut" passage, everything that's not in parentheses is already being done (mining human bodies for organs, plasma, DNA etc); the parenthetical suggestions are meant to point out how bizarre this is, and how little conceivable space is left for capital to expand. Is there some way I could change the wording to get this point across more "sanely"? On the PDF, I switched out the image with a higher res color version. I think it's a pretty good pamphlet!!! And a pretty good depiction of the modus operandis of capitalism. I will certainly forward it. I'm still waiting to hear suggestions in response to my last comment. I'd seriously like to improve this. Knotwho, the new color version looks good. I'll distribute that as well.